Once upon a time there was Terry George who wanted to find meaning in his life. As a music student at Stanford University in the late 70s, he joined a youth volunteer program named Volunteers For Asia where he had been given the opportunity to teach and live in an Asian country. There, at the island of Sumatra in Indonesia, he found his answer—simplicity. Listen to Evan and Kari’s interview with Terry George, Vice President and Executive Director of the Harold K.L. Castle Foundation, as he talks about his career change and how his oriental experience influenced him to work on international relations. He also shares how the reduction of human desires can help in expanding vocational possibilities, paving way for entrepreneurial flexibility. Find out more why he has given up a career that would bring him fame and fortune in exchange for the opportunity to better other people’s lives. Hawaii has been my family’s home since 1971. After graduating from Punahou, I received degrees in International Relations at Stanford University and Tufts University’s Fletcher School of Law and Diplomacy. A six-month post as volunteer English teacher with the Indonesian Department of Health in a small Sumatran city between my sophomore and junior years was my first exposure to dire poverty and to efforts to alleviate it. In graduate school, I concentrated on the Philippines, in which I did field research during the turbulent year of 1986 in the province of Sorsogon on the dynamics of rebellion from the point of view of peasants and local officials. From 1989 to early 1995, I served as program officer for human rights and governance for the Ford Foundation in the Philippines. From my base in Manila, I traveled the length of the archipelago, implementing a grantmaking strategy to increase the capacity of the poor and other disadvantaged groups to use the legal process and democratic institutions to protect and promote their rights and to improve the government’s responsiveness to their needs. I was privileged to have been involved in the launching of a national awards program for outstanding local government initiatives to solve pressing social problems, and the establishment of the country’s first law firm of national scope devoted to the promotion of women’s rights. From early 1995 until early 1998, I lived in New Delhi while managing the Ford Foundation’s portfolios in governance and international cooperation in South Asia. I was responsible for the design and execution of research, policy analysis and dialogue programs to reduce the risks of war and promote greater security and cooperation among the seven nations of South Asia. I also reshaped the Ford Foundation’s strategy of grantmaking in the field of rural local governance in India. My work was based on the following basic premise: when all sectors of a community participate in setting priorities and informing elected officials of those priorities, government is more effective. I spent particular effort to strengthen the effectiveness of women in this process, since Indian women’s priorities are denied a fair public hearing in most local councils. I moved back home to Honolulu in April 1998 to join the Consuelo Foundation as their Chief Program Officer. I was responsible for the design, implementation, supervision, and evaluation of all programs in the state of Hawai‘i. Programmatic goals included strengthening children and families through community development and asset building, preventing child abuse and neglect by strengthening parent-infant bonds, and enhancing the status of women. Over the next five years, I oversaw the completion of construction at a successful self-help housing neighborhood in Waianae, the launching of the Ways to Work Family Loan Program, and the creation of more than $140,000 of assets for low-income families through Individual Development Accounts. I also provided key support for the establishment of the Child-at-Risk Evaluation (CARE) Program to document child abuse injuries and prevent further abuse. Since September 2003, I have been privileged to serve the Harold K. L. Castle Foundation as their Vice President and Executive Director. I am responsible for grantmaking processes in all program areas, which include but are not limited to public education enhancement and redesign, near-shore marine resource conservation, and the development of vibrant communities in Windward Oahu. Through its grantmaking, the Foundation invests close to $7 million a year to build resources for Hawaii’s future. 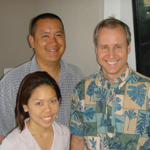 I currently serve on the boards of the Entrepreneurs Foundation of Hawaii and the National Kidney Foundation of Hawaii. My wife, Julie, is a second-grade teacher at Kamehameha Schools, and we are blessed with our young daughter Gracie and our infant son Geoffrey.